MARTHA MOMENTS: PetSmart Giveaway: Martha Stewart Cat Feeders! PetSmart Giveaway: Martha Stewart Cat Feeders! The very nice people at PetSmart contacted me with an opportunity to provide one of my lucky readers with a giveaway from the new Martha Stewart Pets line for cats at PetSmart. The reader will receive the Martha Stewart Double Feeder for cats in signature blue as well as the Martha Stewart Silicon Feeding Mat for cats, also in blue. The items will be shipped directly from PetSmart to the lucky winner to anywhere in the United States or Canada. So, here's what you have to do. It's easy: send an email to dreamboat7@hotmail.com with "Martha Moments Giveaway" as the subject line stating why you deserve to win these pet products, and you don't necessarily have to be a cat owner. Keep the comment short - one or two sentences - and be sure to state your name and write your location in the comment. Again, only readers with Canadian or US addresses are eligible to win these items. This double-feeder is efficient, modern and stylish. Includes air-tight lids for easy travel with your pet. Durable, lightweight, easy to clean. Rust-proof stainless steel bowls that can be removed for cleaning. Silicon ring under rim reduces noise. Liquids stay cooler longer. Non-skid bottom. Rubber base prevents marking of floors. Shaped hand-grip makes moving the bowls easier, without spills. Lids keep food fresh. A PetSmart exclusive. This lipped-edge mat prevents messy spills and makes clean-up easier. A PetSmart exclusive. would be purrfect for my cat!!! and the mat would keep food off my floor!!! hello there, my name is jennifer mcalinden and i have three cats that love martha stewart as i do, they have the martha stewart dog dishes but now they really want the new cat dishes! thank you for your wonderful blog, i just love it! I adore my two cats Norris and Stanley. They were both adopted from a shelter as adult cats and they have been constant companions, though thick and thin. 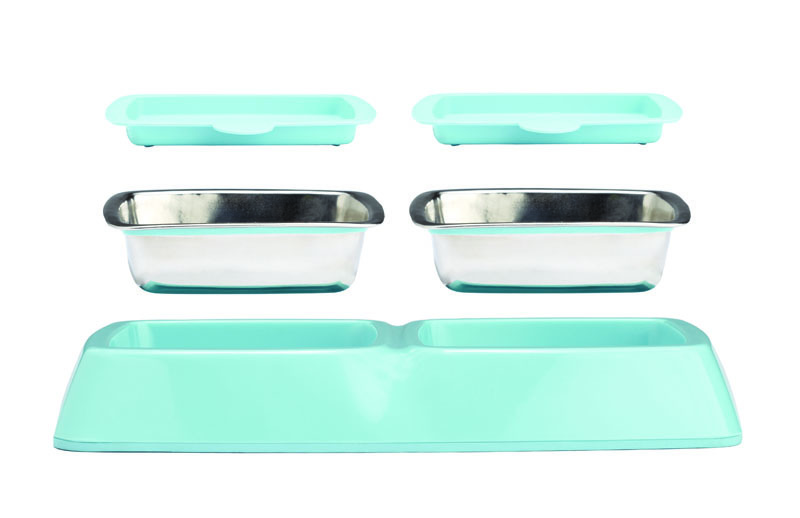 I know they would feel so lucky to be feeding from a Martha Stewart cat dish! Mark Tanner in Denver. With four cats, Martha, Riko, Cinnamon and Sirius (yes, named after Martha Stewart and Sirius Satellite Radio) the feeder and mat would be the perfect addition to our home. Besides.. the blue matches our kitchen! I am desparately looking to get my hands on this food dish or one similar with a lid. PetSmart has been all sold out for a while and I can't find something like this ANYWHERE! Any chance you can tell me where I can purchase one? Thank you!